Not a very good pictures but do not judge the taste by its look. I made this cake for my youngest son during his kindergarten graduation last May. 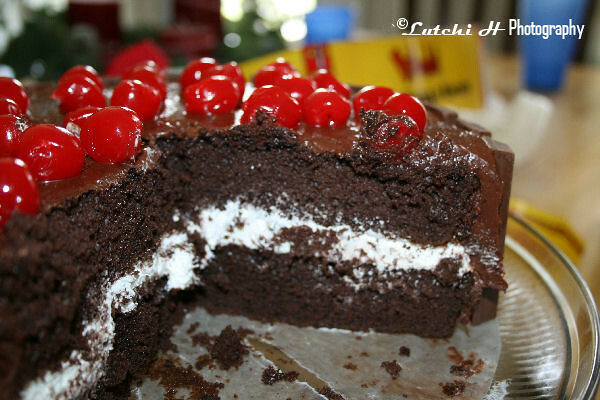 It’s one of the easiest cakes that you can prepare on any occasions. I am not going to make this entry any longer so here is the recipe. 1. Prepare the chocolate cake according to its package direction. 2. While the cake is baking, prepare the filling. 3. Mix all ingredients for filling and set aside inside the fridge. 4. Let the baked cake cool completely before filling and frosting. 5. Carefully cut the cake into two layers. 6. Place the filling on top of the first layer. 7. Place the second layer on top of the first layer cake with filling. 8. Now you can start frosting. 9. 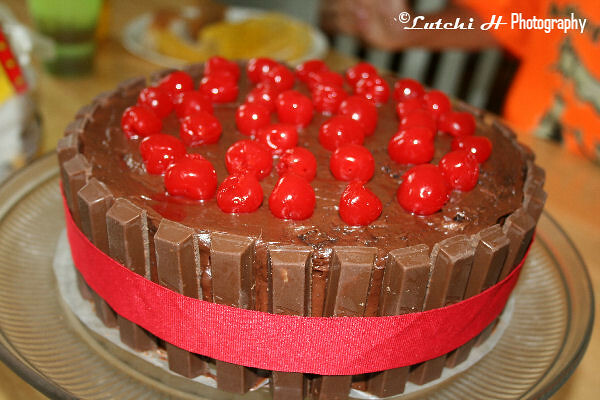 Slowly arrange the kit kat wafers around the frosted cake. 10. Tie the red ribbon around the cake to hold it. 11. Top the maraschino cherries and you’re done. 0 Comments On "Chocolate Cake"